This article is about the year 1632. For the novel by Eric Flint, see 1632 (novel). April 15: The Battle of Rain. November 16: King Gustavus Adolphus of Sweden of Sweden is killed in the Battle of Lützen. 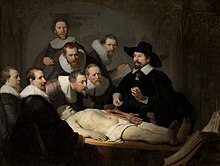 Rembrandt paints The Anatomy Lesson of Dr. Nicolaes Tulp. January – The Holland's Leguer, a brothel in London, is closed after having been besieged for a month. February 22 – Galileo's Dialogue Concerning the Two Chief World Systems is published. March 29 – The Treaty of Saint-Germain-en-Laye is signed, returning Quebec to French control, after the English had seized it in 1629. March – Thirty Years' War – Gustavus Adolphus of Sweden invades Bavaria with his army. April 15 – Thirty Years' War – Battle of Rain: Gustavus Adolphus defeats Johann Tserclaes, Count of Tilly, commander of the Catholic League (German) armies, for the second time within a year; Tilly is severely wounded during the battle and dies on April 30. May – Thirty Years' War – Munich, capital of Bavaria, is captured by the Swedish army. June 15 – Sir Francis Windebank is made chief Secretary of State in England. June 20 – Charles I of England issues a charter for the colony of Maryland (named in honor of Henrietta Maria), under the control of Lord Baltimore. June 20 – Two ships, the Saint Jean (250 tons) and the L'Esperance-En-Dieu, set sail from La Rochelle, bound for Acadia. June 25 – Fasilides, Emperor of Ethiopia in succession to his father Susenyos, declares the state religion of the country to again be Ethiopian Orthodox Christianity, and confiscates the lands of the Jesuit missionaries, relegating them to Fremona. June – Eighty Years' War – Leading a Dutch army, Frederick Henry, Prince of Orange captures in short succession the cities of Venlo, Roermond and Sittard, before besieging the city of Maastricht. July 23 – Three hundred colonists for New France depart Dieppe. August 22 – Eighty Years' War: A Dutch army, led by Frederick Henry, Prince of Orange, captures the city of Maastricht after a two-month siege. September 1 – Battle of Castelnaudary: A rebellion against French king Louis XIII is crushed. The leader of the rebellion, Gaston, Duke of Orléans, the brother of Louis XIII, surrenders. September 9 – Thirty Years' War: Battle of the Alte Veste – Besieged by Wallenstein at Nuremberg, Swedish king Gustavus Adolphus attempts to break the siege, but is defeated. October 15 – The University of Tartu officially opens, in Swedish Livonia. October 30 – Henri II de Montmorency, is executed for his participation in the rebellion of Gaston, Duke of Orléans, against French king Louis XIII. November 8 – Wladyslaw IV Waza is elected king of the Polish–Lithuanian Commonwealth, after Sigismund III Vasa's death. November 16 (November 6 Old Style) – Thirty Years' War: Battle of Lützen – Swedish king Gustavus II Adolphus leads an assault on Wallenstein's army, but is killed early in the battle. Despite the king's death, the Swedish commanders manage to rally the army and eventually defeat Wallenstein's army. As a result, Wallenstein withdraws from Saxony. Following the death of Gustavus Adolphus, king of Sweden, he is succeeded by his six-year-old daughter Christina, while five regents (headed by Axel Oxenstierna) govern the country. November 17 – Thirty Years' War – Gottfried zu Pappenheim, Field Marshal of the Holy Roman Empire, dies from wounds sustained in the Battle of Lützen. Antigua and Barbuda is first colonized by England. The Portuguese are driven out of Bengal. King Władysław IV Vasa of Poland forbids anti-Semitic books and printings. Construction of the Taj Mahal begins. Catharina Stopia succeeds her spouse, as Sweden's ambassador to Russia, becoming perhaps the first female diplomat in Europe. Approximate date – Last inhabitants leave the original city of Reimerswaal in Zeeland. ^ Liljedahl, Otto Ragnar (1935). Sveriges första kvinnliga diplomat. : Egenten Johan Möllers maka Catharina Stopia. ut: Personhistorisk tidskrift 1934. Stockholm. Libris 2776256. This page is based on the Wikipedia article 1632; it is used under the Creative Commons Attribution-ShareAlike 3.0 Unported License (CC-BY-SA). You may redistribute it, verbatim or modified, providing that you comply with the terms of the CC-BY-SA.